Manila, Philippines - Senate President Pro Tempore Ralph Recto in his Senate Bill No. 2073 seeks to abolish the Continuing Professional Development (CPD) law or the Republic Act 10912. CPD law requires professionals to comply with specific number of CPD units every three (3) years to continue with renewal of PRC license. The bill outlined that many professionals are against this law due to the cost of undergoing the required trainings, seminars or other activities undertaken that is related to their profession to earn the necessary CPD units. The bill further explained that while further training is needed to continuously grow and learn as professionals, it does not come cheap especially to professionals who are just starting to practice their respective careers and earn meager incomes. It is likewise said that CPD has been a bigger burden for those who are temporarily accepting jobs, other than their profession due to lack of opportunities. PRCboard.com is one of the trusted websites that provides timely and reliable information in any PRC-related news. For verification, we recommend to refer to PRC official website. 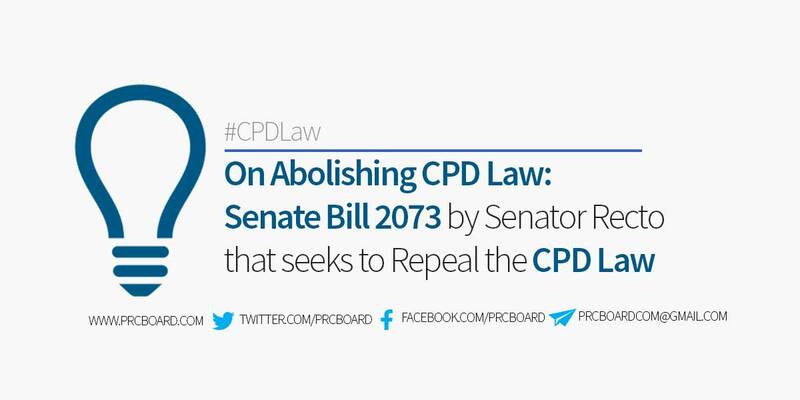 To keep updated on the developments on repealing the CPD Law, we advise our visitors to bookmark this page, visit PRC official website, follow us at our social media pages via Facebook and Twitter or join the members discussions at our Facebook Group. CPD is great provided that the employers should be providing and supporting us professionals because end of the day the organisation will benefit out of it. Also, the the governing body should also provide or organize online webinars or the PRC should accept online training certificates that are readily available. CPD is one of the tools that encourage professionals to get updated to the latest trends in their respective professions. I know, professional organisations makes it somehow, business and made it to difficult for us to attain the points required. If this CPD is abolish, there should be a measure that the company that they are working with ensure that their professionals are up to date in-terms of the latest processes and technologies. It is Good that CPD be abolished,since it is impractical and very costly, imagine if I will be attending a convention in my profession I will be personally spending no less than 20,000 pesos for my fare, accommodation & registration since my profession requires me 60 CPD units and the convention can only provide 20 CPD units I will be attending 3 conventions in 3 years or I will be spending no less than 60,000 pesos in 3 years. It is like robbing us of our rights of renewing our license, the cost is too much to get our license and they gonna take it away from us if we won't take CPD and renew our license. It's not a burden for other professionals but, it's death for their dream. I have been to CPD trainings, and some of them I tell you, is not worth our money. We travel,pay for hotel, after that we have an un-ready presentation..
Abolish this CPD thing or what its called pera pera lang to. Abolish it or hundreds, thousands or even million will stop renewing their license. PLEASE ABOLISH CPD . WE HAVE TO SPEND MONEY FOR NOTHING THAT MAY USED IN THE EXPENSES OF OUR FAMILY. I have never renewed my license. I can't afford conventions.